Which of these signed baseballs is authentic? (The answer is at the bottom of the page). Sports autograph authentication is my specialty. My COA could help you obtain higher prices if you are selling autographs. My letter of rejection will help you obtain a refund for bogus autographs! It appears that a "sting" operation has taken place in the autograph hobby. Apparently, computer reprinted photos, with copy autographs, were sent to some very well known and expensive authenticators, who then authenticated these items as legitimate. I say apparently because I have read this story on an anonymous website, where the author is too cowardly to come out and sign his name to his stories, so I cannot give the information 100% credibility. However, since this was done to me also, it might be a credible story. I received a group of four photos with alleged autographs on them. One of them turned out to be a copy of an autographed photo, with a copy autograph that was part of the photo and not actually signed. I identified it as such to the person who sent me the photos. A couple of weeks later that same person sent me one more photo, which was also a copy of an autographed photo. I also correctly identified the alleged autograph as not being an autograph but a copy of an autograph. My more "illustrious" competitors apparently failed this test. It was apparent if you bothered to take the photo out of the holder it was in. Do you know what happens if you send your item to the highly visible authenticators who cannot authenticate your item. They give you a credit for a future authentication. But what if you don't want to send them something again. You are stuck with a credit that you cannot use. If I cannot authenticate your item, you get a refund from me, less my return postage costs. What is fairer then that? I guess the other companies just need to keep your money. Rich, Thanks for the help with the info to get my money back for the bogus Ruth baseball. They finally posted the money into my account. I owe you one. Thank you, Nick Grassi (nikkog53@optonline.net). The work I do was prominently featured on the HBO TV show "Real Sports" on Jan. 17,2006. They conducted an undercover test on autograph authenticators, including forensic examiners and others, and I was one of the two who was widely praised on the show. Seven authenticators work was examined on the show during an undercover operation. I was one of only two authenticators who was praised for the work that was done. Five of these authenticators examined 27 forgeries, supplied by the FBI, and they only identified five of them correctly. I was lauded on the show at two different times in the twenty minute segment for my examinations. I examined seven different forged items and correctly identified six of them as forgeries. This HBO show was posted on You Tube. However, due to copyright laws, and copyright claims by HBO, the video had to be removed. My work was also commended in a story about the autograph business in the New York Daily News of Feb. 19,2006. The FBI has publicly stated that a majority of autographs in the hobby are NOT authentic. I have worked with two government agencies to detect sports autograph forgeries. If various government agencies have faith in me, then you should also. Krause & Kalfayan, San Diego. This law firm retained my services in their class action lawsuit against ebay. If I am good enough to authenticate for the New York City Department of Consumer Affairs and good enough to authenticate for the Nassau County,NY prosecutors office, then aren't I good enough to authenticate for you? My COA is actually signed by me. Not by a bunch of facsimile autographs so you have to guess who actually examined your item. If you need to talk to me I am always available. Try to talk to any other authenticator on the phone,,, good luck with that. CLICK HERE IF YOU HAVE SOMETHING TO AUTHENTICATE and want pricing information and shipment instructions. I received a photo to examine on 1/14/03. 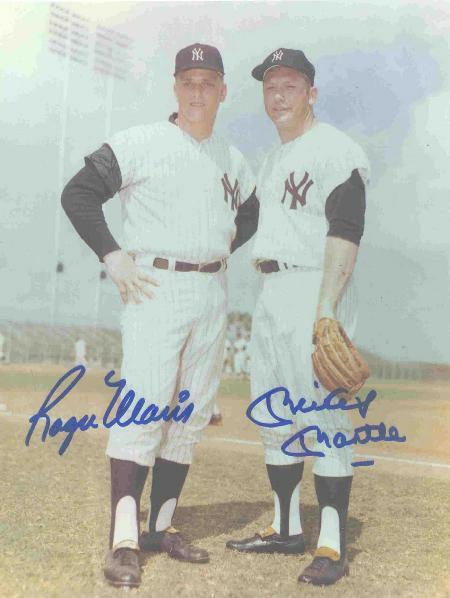 It was a "signed" photo of Mickey Mantle and Roger Maris. When I started to examine this photo under magnification it immediately appeared that the photo was computer generated and was not originally signed. The reverse side of the photo had a "Kodak Image Magic Paper" imprint. I then took the extra step and called The Kodak Company in Rochester, NY. I spoke to their product information department. A Kodak employee told me that this paper was first manufactured in 1996. Mickey Mantle and Roger Maris both died before the paper was manufactured. This is the photo. It was sold on ebay. My client got a refund as did another buyer who was scammed the same way. I can save you money too! Here is another example of the work that I have done: I have always been a little skeptical of signed vintage wire photos. In my opinion they were just not that plentiful and easy for players to sign. 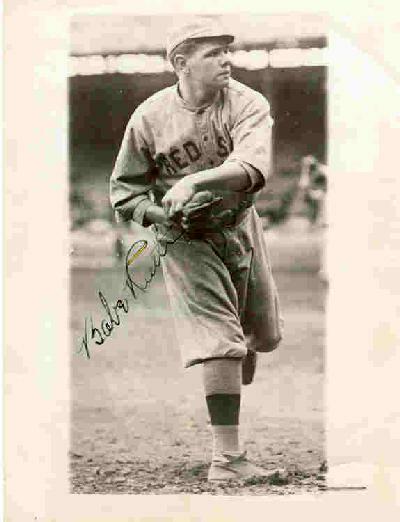 I received a Babe Ruth "signed" wire photo to examine. I was skeptical of the signature. The paper caption on the back referred to a mid century poll taken by the Associated Press to name the greatest baseball player ever. I researched the poll on the Internet and found out that it was conducted in 1950. Babe Ruth passed away in 1948. Here is the photo. I will always take the extra steps necessary to examine your items properly. All your items are examined by me, I don't have "authenticators" who sign COA's and don't really examine your items. 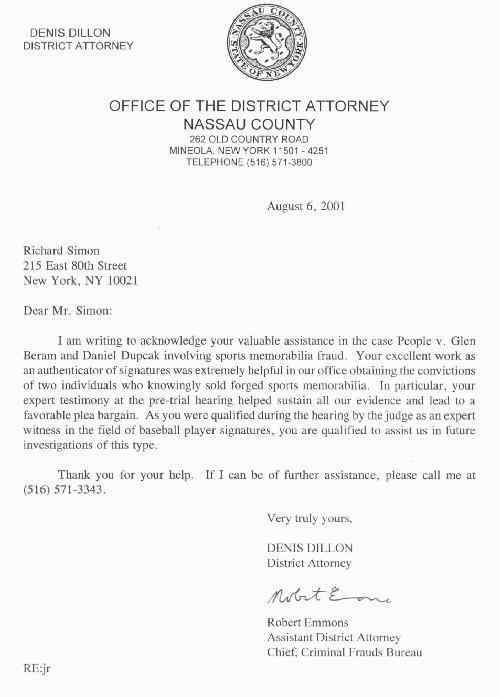 Declared an Expert Witness, in baseball autographs, by a Nassau County, New York judge in prosecution of a sports autograph forger in the case of People vs. Beram and Dupcak. This forger and his accomplice pled guilty. I am one of a tiny handful of authenticators to testify against forgers in criminal cases regarding sports autographs and I am one of a tiny few sports autograph dealer/authenticators to work with law enforcement agencies. My credentials are unmatched by anyone in the sports autograph hobby. My expertise has been used by many auction houses and two major government agencies. My opinion was reinforced on three sports autograph items by unbiased forensic police examiners, two in New York City during the ebay investigation and one by the head of the Forensic Lab of the San Francisco Police Crime Lab. These forensic examiners are totally unbiased and are currently employed by police departments. Two of these items came with forensic COA's from examiners working in the hobby. My examination and the examination by unbiased police forensic examiners totally refuted the hobby forensic examiners. The hobby forensic examiners said the items were authentic, the police agreed with me that the items were bogus. I have written for Autograph Collector Magazine, Pen and Quill Magazine (the publication of the UACC) and Beckett Vintage Collectibles magazine. Extensive file of exemplar signatures. Completed correspondence course in Forensic Document Examination. 25 years as a sports autograph dealer and authenticator. 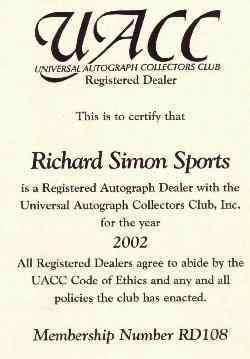 Don't you want someone examining your autographs with 25 years experience in SPORTS autographs who has worked with law enforcement regarding sports autographs and who has authenticated for established auction houses? You will get an honest examination if you submit your items to me. I am not "in the pocket" of the many crooked sellers who pollute this hobby on the internet and at collector shows. My examinations of signed baseballs will always include an examination by UV light. I will detect any alterations in signed baseballs. If you own single signed baseballs now, I urge you to submit them for an examination. It is possible that some of the single signed baseballs in the market have been altered, without that information being revealed to the collector. If you wish, upon request, an appraisal will be included at no extra charge with the authentication of your item(s). If you are selling sports autographs on ebay or elsewhere, a COA might help you achieve a higher price. If I have authenticated your autograph be sure to mention in your ebay ad that you have a COA from me. Your bidders will be confident when they see my COA. If you are buying a sports autograph on ebay or elsewhere, tell the seller that your purchase is contingent on getting it authenticated. Then have the seller ship the autograph to me for examination. This is the wisest way to buy autographs on ebay now. There are authenticators in the business who will authenticate ANYTHING. If you do your homework you can figure out who these people are. The authenticators who will authenticate everything are well known in the hobby and serious collectors and dealers would never use them. Babe Ruth, Lou Gehrig, Ty Cobb, Cy Young, Christy Mathewson and other rare Hall of Famers - $80 each. Ted Williams, Mickey Mantle, Joe DiMaggio - $60 each. A Brooklyn Dodger team ball or a Yankee team ball with Ruth or Gehrig or Mantle - $125. CLICK HERE IF YOU HAVE SOMETHING TO AUTHENTICATE and want more information. AFTER EXAMINING your item, I scan it, and save it in my database. This scan is printed on the COA. My corporate embossed seal is imprinted on the COA. This makes it virtually impossible to switch the authenticated item. (I don't feature two types of COA's so I can dip my hand into your pockets again. Some authenticators issue a COA for an auction house (the auction house has already paid them) then ask you to pay them to upgrade the auction house COA to their "regular" COA, as opposed to the auction house COA. Why do these authenticators issue two different types of COA's? Does this sound right to you? I also scan and save items that in my opinion are not authentic. I DO NOT PLACE LABELS, MARKS OR ANY WRITING ON YOUR VALUABLE ITEMS. Labels and/or chemicals might cause harm to valuable items. Labels are not acid free. The long term effects of placing labels or chemicals on your items are unknown. Turnaround time is one week or less, not the multiple weeks you wait with other services. Lower prices, faster turnaround and personal service (your e mails and phone calls are answered directly by me) are what I offer to you. Your items will be returned to you by UPS or Fed Ex. The UPS shipping charge to return your items is $24 (with $1000 insurance), $27 (with $1500 insurance) , $35 (with $3000 insurance), $45 (with $5000 insurance). If you need the items returned by Fed Ex, please inquire for rates. Please insure your items when shipping them to me and if possible take a scan or photo of your items. Additional insurance is available, inquire about rates. Want to pay for your authentication right now? Click the PayPal icon now or you can enclose payment with the item. 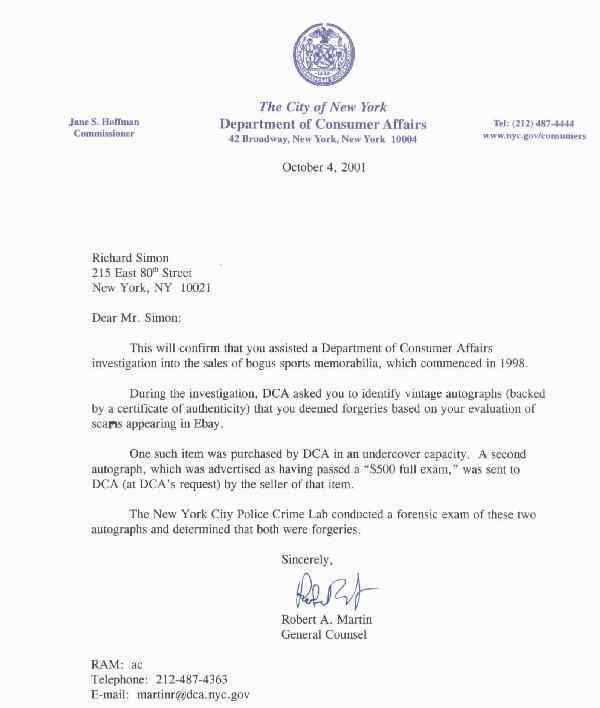 READ THIS LETTER AND SEE HOW I HELPED A NEW YORK FORGER GO TO PRISON. READ THIS LETTER AND SEE HOW I IDENTIFIED FORGERIES ON EBAY. The purported Christy Mathewson game ball from the 1905 World Series has been withdrawn from an upcoming sale by American Memorabilia Auctions. Auction officials have determined the ball is "a fake." Victor Moreno of American Memorabilia told Sweet Spot Online that authenticator Richard Simon of New York determined that the ball could not date to 1905 since it was a John Heydler baseball. Baseballs stamped with Heydler's name as president of the National League weren't introduced until 1919, he said. The ball has garnered a nice history of news coverage over the years, which provided provenance for the ball. It also gave a Florida consignor hope for a six-figure payout. The auction is scheduled for Feb. 28, but the ball signed with a likeness of Mathewson's autograph and a real Roger Bresnahan signature that rates a 3 on a scale of 10 won't be part of it. Simon said he immediately had doubts about the signature when he first saw the ball, citing several major flaws. Perhaps Mathewson had a bit too much sauce in celebrating the Giants '05 victory over the Philadelphia Athletics, he figured. After further study, he was certain the signature was just plain bad. The auction house originally believed the provenance of the ball. So did auction giants Christie's and Sotheby's. The story went as follows: Christy Mathewson's final strike in the 1905 World Series was caught and kept by catcher Bresnahan, who supposedly had his pitcher sign the sphere later. Bresnahan hit .315 in the Series; and Mathewson pitched a record three shutouts, an accomplishment that capped a 31-win season. Years later, Bresnahan gave the ball to the son of a friend, who was a batboy for a Toledo team he coached. Fast forward 75 years. The granddaughter of that lucky recipient found the ball and learned of its history. "The consignor is totally innocent on this," Simon said. "Bresnahan told them the story all of these years. He probably thought he was doing something nice for this kid, making him believe he had something truly valuable. The consignor is still in a state of disbelief. She was totally stunned." Moreno was disappointed he had to pull the item from the sale, but said the integrity of his company was worth more than any commission the item would generate. For a complete account, see the February/March 2002 issue of Sweet Spot. CLICK THE ICON TO VIEW A PAGE PICTURING QUESTIONABLE AUTOGRAPHS. CLICK HERE IF YOU HAVE SOMETHING TO AUTHENTICATE AND WANT INFORMATION. Click here to make a donation to a worthy cause. The Ty Cobb baseball is the authentic one, the Robinson is a terrible forgery.